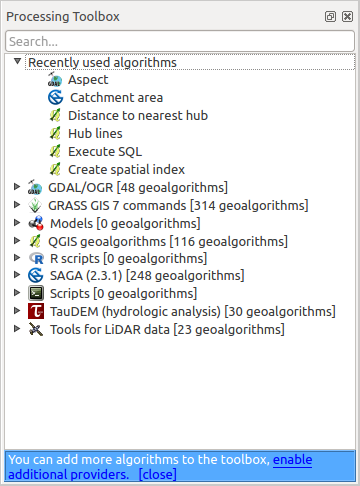 Este capítulo introduce al marco de procesamiento de QGIS, un entorno de geoprosesamiento que se puede utilizar para llamar algoritmos nativos o de terceros de QGIS, haciendo su tarea de análisis espacial más productivo y fácil de lograr. En las siguientes secciones, revisaremos cómo usar los elementos gráficos de este sistema y sacar el máximo provecho de cada uno de ellos. There are four basic elements in the framework GUI, which are used to run algorithms for different purposes. Choosing one tool or another will depend on the kind of analysis that is to be performed and the particular characteristics of each user and project. All of them (except for the batch processing interface, which is called from the toolbox or the algorithm execution dialog, as we will see) can be accessed from the Processing menu item. (You will see more than four entries. The remaining ones are not used to execute algorithms and will be explained later in this chapter). The Toolbox. The main element of the GUI, it is used to execute a single algorithm or run a batch process based on that algorithm. The Graphical modeler. 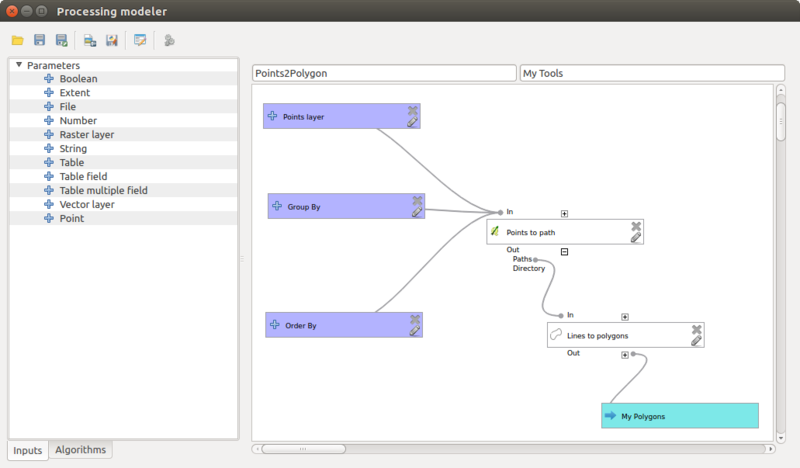 Several algorithms can be combined graphically using the modeler to define a workflow, creating a single process that involves several subprocesses. The History manager. All actions performed using any of the aforementioned elements are stored in a history file and can be later easily reproduced using the history manager. The Batch processing interface. This interface allows you to execute batch processes and automate the execution of a single algorithm on multiple datasets. En las siguientes secciones, revisaremos cada uno de los elementos a detalle. Some processing algorithms can be accessed via the Vector menu which lists some tools from the processing framework but also from plugins.